Prowlin' With Matt The Cat » R.I.P. 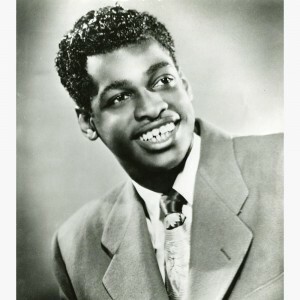 We just learned of the death of blues singer/pianist LITTLE WILLIE LITTLEFIELD. He actually passed away on June 23 in the Netherlands. LITTLEFIELD was 81 and died of cancer. He was born on Sept. 16, 1931 in El Campo, TX and began playing guitar at an early age. By his teens, LITTLEFIELD had switched to piano and had already started developing his trademark boogie woogie piano-style of triplet playing. By 1948, he was making a name for himself and caught the attention of the Bihari Brothers of Modern Records. They brought him out to LA and in the early fall of 1949, LITTLEFIELD took the R&B charts by storm with “It’s Midnight (No Place To Go)” (Modern), reaching #3 on the national R&B Chart. Two other hit singles followed: “Farewell” (#5 in ’49) and “I’m Lost” with Little Lora Wiggins (#10 in ’51). LITTLEFIELD will always be remembered as the cat who first laid down the Leiber/Stoller classic “Kansas City” (first called “KC Lovin'” when LITTLEFIELD cut it in ’52). His version didn’t chart, but it set the mold for the hit versions that would follow, especially Wilbert Harrison’s 1959 chart-topper on Fury Records. Little Richard and The Beatles were two other big artists from the long list that have recorded versions of “Kansas City.” LITTLEFIELD didn’t have any more chart hits, but he continued to release records on Federal, including duets with label-mates Lil Greenwood and Little Esther until the mid-1950s. In the 1970s, while getting into the swing of doing European tours, LITTLEFIELD decided to settle in the Netherlands, where he married and spent the rest of his life. He was there for the development of post-war rhythm & blues and rock n’ roll and remained true to his artform. He continued to perform the boogie woogie piano style he helped to develop until the day he died. BOBBY “BLUE” BLAND passed away on June 23, 2013 at the age of 83 from complications from a long illness. BLAND was one of the most influential blues cats of the mid-20th Century, coming out of Memphis with a style all his own. He wasn’t gruff and he wasn’t raw…BLAND’s style was smooth and soulful. He was born in Rosemark, TN on Jan. 27, 1930. In Memphis, he joined up with The Beal Streeters, a revolving roster of musicians that at one time or another included B.B. King, Johnny Ace and Little Junior Parker. BLAND debuted on Duke Records in 1952 with “I.O.U. Blues” b/w “Lovin’ Blues.” After a stint in the Army took him away for a few years, he was back on Duke in ’55 with “Time Out” b/w “It’s My Life, Baby.” His chart debut came in late summer, 1957 with the #1 R&B smash, “Further Up The Road” (Duke). From there, BLAND racked up 62 more R&B hits up through 1985, including 2 more #1s (1961’s “I Pity The Fool” and 1963’s “That’s The Way Love Is”). 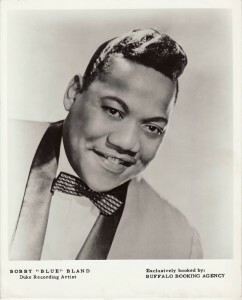 BOBBY “BLUE” BLAND was called the “Sinatra Of The Blues” due to his smoothness and phrasing, BUT the man could still scream…a full, hardy, soulful, almost other-worldly scream as witnessed in this 1962 R&B Top 10 classic, “Yield Not To Temptation,” one of my all-time favorite BOBBY BLAND tunes. Rest in peace, Mr. BLAND. We’ll sure miss you down here. 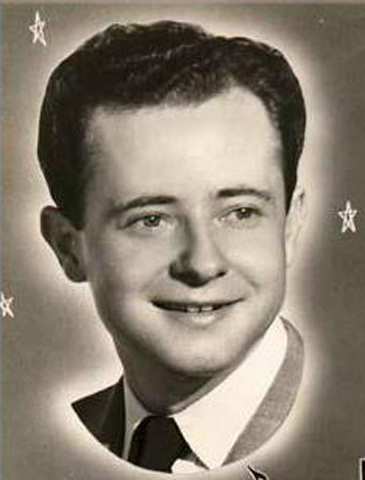 GORDON STOKER of the Jordanaires has died at 88! The Jordanaires were of course one of the great gospel quartets who will forever be linked to rock n’ roll having backed up Elvis on countless recordings. Their distinctive sound can be hea…rd on Ricky Nelson and Jack Scott records as well. STOKER joined the group in 1949 as its pianist and then became 2nd tenor in 1951. I spoke to GORDON on the phone a few years ago and he was very kind. His mind was still sharp and he could still remember nearly every Jack Scott record they sang on. I love their rendition of “Working On A Building.” You can see GORDON STOKER prominently on the far left of the frame below.